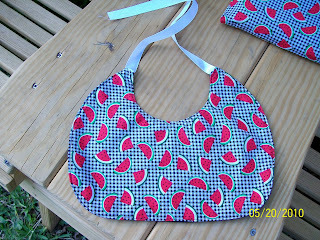 I, Crystal (http://sewingbycrystal.blogspot.com), sign up as a participant of Self-Stitched-September. I endeavour to wear 1 handmade and refashioned item of clothing accessories/ jewelery every day for the duration of September 2010. For more information and to see who is participating in Self Stitched September, visit So, Zo ... and join in yourself. 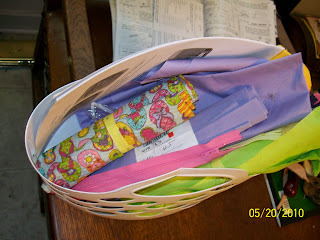 So another week has passed and I thought I would note what I bought and what I have accomplished sewing-wise this week. First I was re-bitten by the cross stitch bug last weekend while on vacation. I took a WIP I dug up with us and worked on it in the truck on the way and on the way back plus some in the hotel. And now that we are back home, Mitch (hubby), Logan (oldest son) and I have been watching Lost Season 1 through Netflix so I often stitch at night while watching that. I made great progress on my Federal Duck Stamp (Canvasbacks) this week and we have finished Season 1 of Lost and started Season 2. No pictures at the moment. I also did some sewing this week. I spent a couple of hours working on baby items for sale in my etsy shop on Thursday afternoon and worked some more on Friday and Saturday. I still need to get started on the teacher gifts and work on my sister-in-law's baby shower gift as well. The big news is I got a new sewing machine on Saturday - I got it for $10 at a yard sale. It's in a cabinet and it's older and metal and has a knee pedal like my mom's beloved Kenmore I sewed with years ago before someone tossed it into the yard after our house was flooded (that is another rant entirely). I tried it out on Saturday and really like it. It seems to do a lot and I will post pictures later in the week - haven't had time to download them yet. It is a Dial Sew and I can't remember the model number now. But I feel it was a steal for $10. I won't get rid of my Brother or my serger, but it's nice to have my own sewing table in the dining room and it folds out to plenty of room for my cutting mat and other necessities. I figure I can close it and set my Brother or my serger on it when I need to use them. 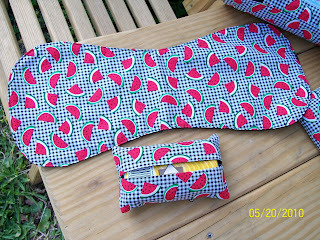 I spent a lot of time blog-hopping this week for the Sew, Mama, Sew's giveaway day. What fun it was to enter giveaway and even more fun to find more wonderful blogs to read and be inspired by. It's you, other bloggers that keep me inspired and wanting to sew more. I bought some fabric from an etsy seller I found while blog hopping this week - hopefully it will come before I leave work today and I'll post pictures and more information next week. On the children front: School is winding down and that meant EOG's for oldest son. He did fine, I'm sure, we talked to him about not stressing about it and it turns out he did a little the first day, then when he started the tests he said they were easy. Whew - that was a load off of my mind. Youngest spent most of the week wearing his rain boots to school - he's 5 and wearing these adorable green boots with eyes and mouth on them with shorts - yes he's his own person and amazingly enough they didn't wear blisters on his legs like I thought they would. T-Ball has also finished as of Saturday - Jacob seemed to enjoy it and he did great - by the end of the season he was really in to it, he loved hitting the most but fielding was fun too. So that's my weekly summary. I'm leaving work in just a little while to head out-of-town for DH's pre-op for Lasik or PRK (or RPK, I can't remember the initials). We're hoping he gets scheduled for surgery tomorrow and then we can just stay up there tonight. I have to work from the motel some (deadlines) but I'm thinking of dragging my sewing machine and some projects to work on, but I'm not sure I'll fool with it - cross stitch would be a lot easier to bring. 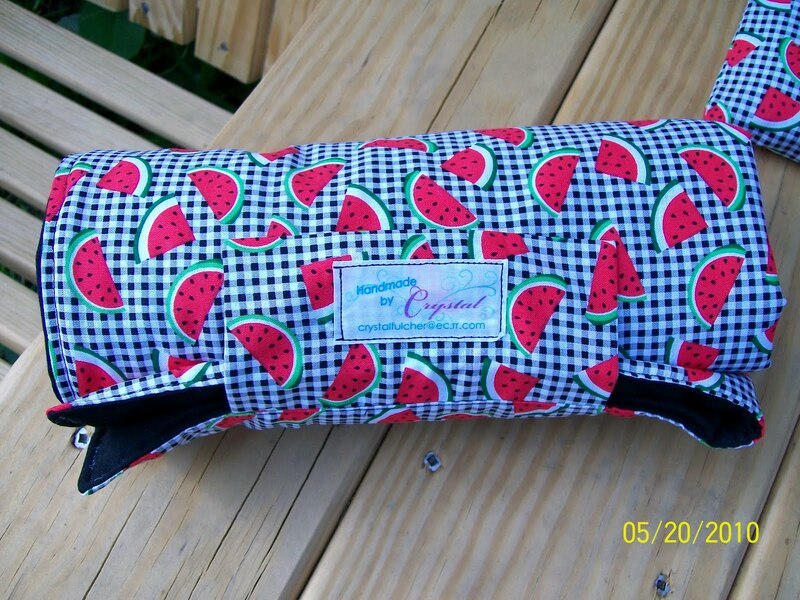 After making my mom's Miche bag cover for Mother's Day, I found I had most of the 2 yards of cute black and white watermelon fabric left. So I thought it would be fun fabric for the baby items I make for my etsy shop. I cut everything out a few weekends ago and have been sewing a few things at a time when I had time. So Thursday afternoon when I got off of work early, I got busy finishing up one set of the baby items so I could post them in my etsy store. Forgive the pictures - I thought there was enough light, but I guess not - I'm going to retake them tomorrow before listing it. I think it came out really cute and makes a great summertime baby set. I figure if I commit to this then I will actually go home and sew tonight instead of planning on it and then doing something else. 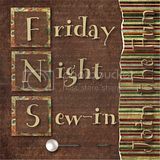 So I will join in on the fun with Heidi of Handmade by Heidi and Bobbi of Crafty Vegas Mom and everyone else (over 100 at this time) and sew tonight. Tomorrow I will hopefully display something that I have done and go and peruse the other blogs to see what is going on. So if you can, make it a point and join in tonight - a virtual sew-in - it's sure to be a lot of fun! Okay, my son, Logan (the 9-year-old) and I worked together yesterday afternoon for a few minutes to decide what I am making for end-of-the-year teacher gifts. I showed him a recent pattern purchase from Keyka Lou of a zippered pouch and he agreed that was a good gift (he has told me that several of his teachers look forward to their gifts from me because they always know it will be handmade - that makes me feel so good). He has had the same art teacher and afterschool teacher for several years now that I have to keep coming up with new ideas/patterns. So we chose this pattern and I am making the medium one. Luckily I picked up this great flip-flop fabric in the remnant bin at last weekend's foray into Hancock's Fabrics and I keep a stash of remnant cottons so I grabbed several colors that go with the flip flop fabric and put them together. Logan likes the lavendar the best so I will make as many as I can using that. I bought a bunch of zippers from ebay recently (no local stores) for a great price so I showed those to Logan as well and he helped me pick out the ones to use. So I have the fabric and notions ready to go to make six of these babies in the next two weeks. I'll start on them tomorrow after I knock a few more baby things out. Here's a picture of my basket for this project - colors are much more vibrant than my camera captured inside. I have made several of Keykalou's patterns and the patterns and instructions are great so I look forward to trying this one out. 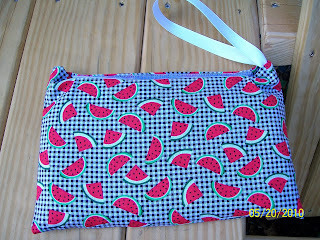 I am also hoping to make me one of these to throw in my beach bag for the little things. 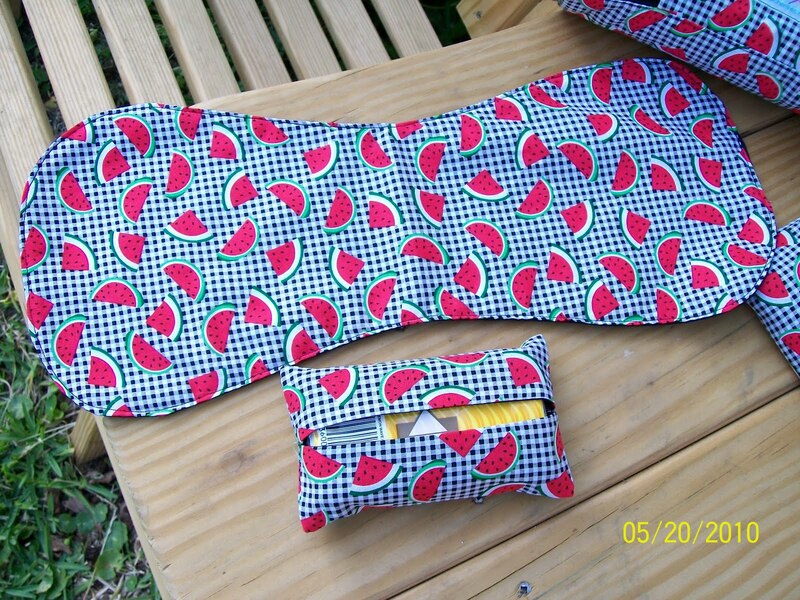 So what do you think - cool fabric choices or not? Good teacher gift? 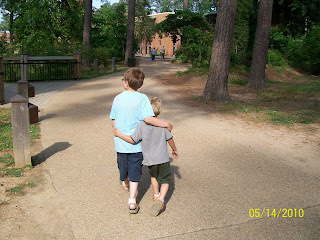 I just spent three wonderful days with my three favorite boys in Williamsburg, Virginia. We finally got to take a family vacation with our tax return this year and my hubby and I enjoy the Williamsburg area and the fact that it's only about 4 hours away from home (well with 2 adults it is, add in the two boys that have to go to the bathroom at random times and it's a little longer). We all had a blast, we went to the Jamestown Settlement, played miniature golf, went back to Jamestown, shopped some, went to Bass Pro Shops, played in the indoor pool at the hotel and went to the Maritime Museum. Add to that lots and lots of great food. Mitch and I couldn't wait to eat at Red, Hot and Blue again but weren't sure if the kids would like it. Turns out it is now both of the boys (one is 5 and the other is 9) all-time favorite restaurant (beating out our local mexican place and McDonalds). They have a great kids meal and the kicker is they give a pack of Oreos for dessert - nothing pleases my boys' more than Oreos. So it all went well - there were ups and downs and the fast food we went to get wasn't exactly fast, but all-in-all a wonderful time. I even got to sneak away for about 30 minutes to the Hancocks in Williamsburg (only about 1 mile from the hotel) and bought a bunch of remnants which are great for the various small things I like to make and a couple of packs of magnetic snaps and a hemming tool - it's one of those ruler like things that you can press over and helps make the hems more even and I really need that. I spent my mother's day money there and enjoyed it. I never did check if there were other fabric shops in the area, but the vacation wasn't about me - it was about the kids so I was glad to have the 30 minutes I did have and I got some really cute fabrics. I'll post some pictures later this week. For now I will leave you with my absolute favorite picture from the whole trip, and no this was not posed. We were leaving Jamestown when it closed on Friday night and the boys were walking in front of us and Jacob (the youngest) just walked up to Logan and put his arm around him and instead of pushing him away, Logan put his arm around Jacob too. Thankfully I had my camera on my wrist and was able to quickly snap a picture before they started pushing each other again. But is this not the most precious picture (all mom's of more than one child or anyone that has a sibling will understand - I was an only child so I never understood until I had two kids). As I was perusing Amazon recently and reading blogs I have come up with a few books that have made it on my wishlist. I have some Mother's Day money and I may be buying some of these with it because goodness knows after filling my new shelving unit - I really don't need any fabric at the moment. The family is going on a trip this weekend, however, and I did find out there is a Hancocks about 1 mile from the hotel - can you say quick run over there while the kids and daddy are resting one evening? I'm also going to check out the internet and see what fabric stores are in the area, but shopping will be minimal because we plan to do a lot of sightseeing and just having family fun. A trusted classic since 1975, Vogue® Sewing has remained a consistent bestseller and sewer’s favorite. Now it’s been fully revised and updated, with the latest information and all-new photographs and illustrations, introduction, and page layout. From choosing a machine to mastering couture techniques, it covers everything stitchers need to know to make professional and fashionable garments. It’s certain to remain the premier sourcebook for sewers everywhere. This technique-rich Vogue’® manual contains comprehensive instructions for understanding pattern markings, selecting fabrics and notions, hand-stitching and mending, pressing, and measuring to fit. Everything’s beautifully laid out, with charts and detailed explanations. And as it teaches, it also steers you to the right project for your sewing level, with a plethora of photos that showcase different options for both beginners and those more expert with a needle. Saw this on Patternreview.com this morning and I want it - trying to decide whether to preorder it or now. This one looks good to me - has anyone read it or heard more about it - it has one 5-star review on Amazon.com. Making clothes is fun, fashionable, and thrifty but how can you find a pattern that fits you just right? And how can you adjust it if it doesn't? This book shows you how to get the most from sewing patternsâ€”from choosing the right size to understanding all the different markings and translating flat shapes into wearable garments. You will learn how to change the shaping, length, and detailing to suit your own body shape, taste, and style. 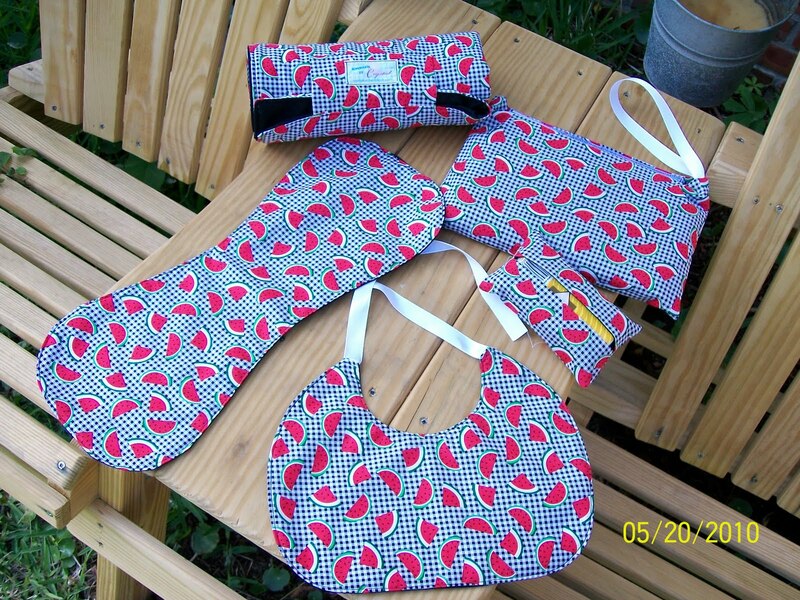 Once you understand how to adapt a store-bought pattern you are well on your way to designing your own clothes. You'll understand how to make a new pattern out of a ready-made store-bought one, or draft your own from scratch. Presented in a new edition that adds updated pattern industry news and revised rules for selecting pattern size, this easy and practical fitting system requires no measuring, no drafting skills, no muslin mock-ups—and it works with all brands of tissue paper patterns. Real people of all ages are featured in photographs that explain the steps of cutting out pattern pieces, pinning them together, and adjusting the fit. Special attention is paid to tricky challenges such as accommodating a full bustline, adjusting sleeves, or reworking a garment to make it more flattering, as well as alternative fitting methods such as draping and computer design. Metric conversion charts, charts for comparing pattern company bodice measurements, and a history of American dress design (Just where did size 10 come from?) make this book a versatile reference. One-Yard Wonders will delight anyone who has ever fallen for fabric - from the novice sewing enthusiast to the lifelong seamstress. The book presents a delightful array of simple, stylish projects that can be made with just a single yard of fabric - from apparel to accessories, from plush toys to pet beds, from baby items to bags, and from home decor to "Happy Birthday" banners. Projects have a hip,contemporary flair, and most can be completed in a few hours. For each project, the book provides a full-color photograph, easy step-by-step instructions, and simple illustrations. Templates and pattern pieces are also included wherever needed, making this collection of 101 projects the best sewing deal ever. Great fabric demands to be purchased, even if it's just a yard or two at a time. But such tantalizing textiles should never hide in a closet; One-Yard Wonders promises gift-worthy solutions for that stash of irresistible fabric-store buys. 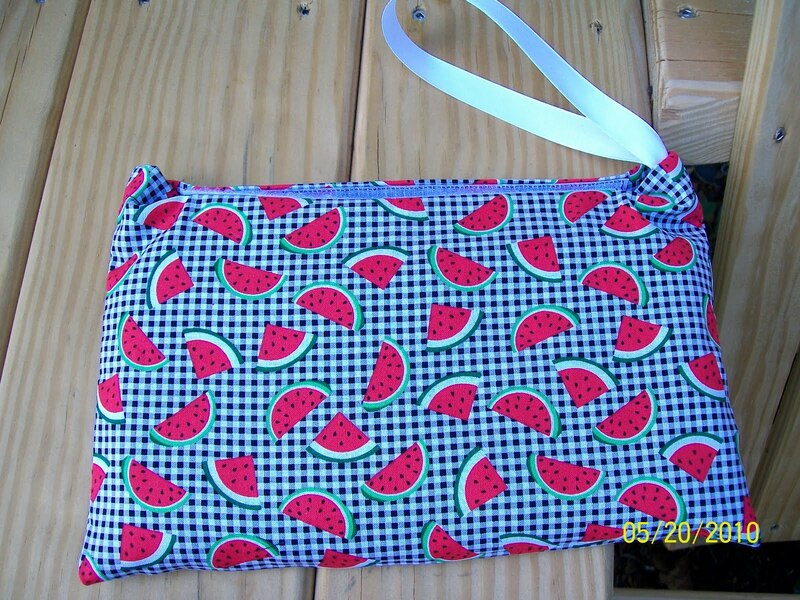 At last, it's time to stop storing and start sewing! Okay - that's just a few, but those are the ones that headline my wishlist at the moment. What's on your wishlist and what's your favorite sewing book of the moment. I would love to know so I can add to my wishlist. I'll spotlight some of the books I have in the next few weeks.